Help! Motor stutters after getting wet. Is it ruined? So I made an unintentional water landing. Whoops. The ESC is dead for sure. I ordered another BLHeli 20 Amp on Amazon. Plugged it in, and now the motor barely does more than a stutter. 1. Is the motor ruined and the stuttering is proof? 2. Or does the ESC need some kind of configuring? That to me looks like one of the three leads from the ESC to the motor is loose or bad. Double and triple check those connections for cracks or bad soldering joints. 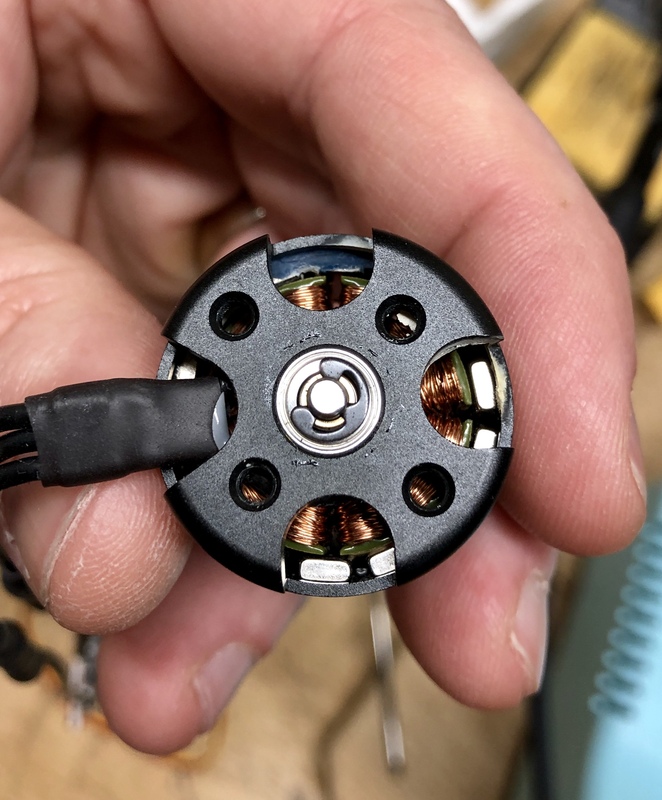 Brushless motors are essentially waterproof, so a dip in the lake won't hurt them. Trust me, I've drowned each of my airplanes at least once. It's like a rite of passage for my equipment lol. Agreed, and sometimes the leads can break off right where they go into the windings as well. The rapid cooling from the water is more likely to have cracked a wire or insulation than have caused actual moisture damage. In my trade it's common to wash and bake an electric motor to remove dirt and grease. Bearings don't like water at all though, does it turn smoothly by hand? It might be a good idea to add a drop of oil to each of the bearings anyways. I agree with @Arcfyre and @evranch, water will not hurt brushless motors. You have a broken lead or a short. Give all of the bullet connectors the tug test. Check the wires to see if any insulation has been chafed, if so cover with electrical tape. Assuming the battery has a good charge. I usually run a 30 Amp on a motor that large, 20 might be okay though. I agree with others on here for question "1", water shouldn't hurt it. Make sure no particles are stuck inside the bell housing, especially magnetic stuff, it's a really tight clearance. For question "2", yes, it might need calibrated. Usually done by connecting esc + motor to your powered up receiver. Put the throttle to 100% and then plug in the ESC like you have in the video. After you hear the beeps then throttle down to 0%, then you should here more beeps and that's it. Unplug it and plug it back in and it should work if that was the problem. Hope this helps. Another thing to check is the esc timing, one of many problems I have seen people have. Hope you get it fixed soon and you get back in the air . Thanks all. So I checked all bullet connectors and re-soldered them. Motor still stuttered. I then recalibrated it. Motor still stuttered. I then spun it by hand while giving a little throttle and it started to spin better. I removed all the mounted screws and noticed a 'white powder'. After that, the motor ran full speed like normal for a few seconds, then went up in smoke. Right before it when up in smoke, took these photos of the white powder and something else that was bridging the gap between two of the magnets. I landed in a swimming pool. The ESC shorted out and was constantly sending power to the motor until I disconnected the battery. Almost looks like some sort of electrolysis happened while in the water. So time for a new motor. Should I stick with Emax 2213? I am still a pretty new pilot with only about a dozen flights in my Simple Cub. I was 3 channel up until the pool landing. This was my first 4 channel flight. First 10 minutes were good...then I just lost it. Swimming pool water is quite a bit more aggressive than pond water, as you found out. If you were happy with the performance, I would replace it with another of the same motor. 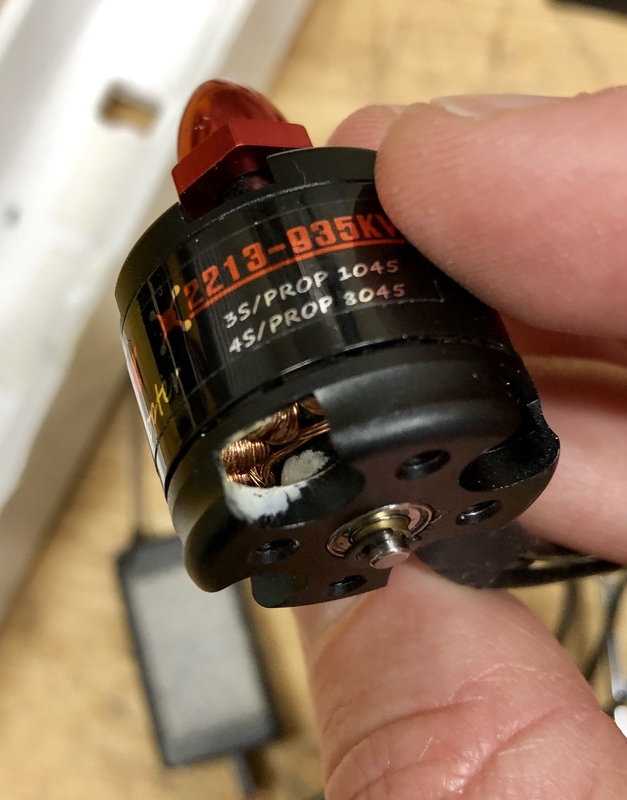 I hope you were spinning it by hand with the prop off, because when damaged motors suddenly start up , props can be pretty rough on the fingers. I have a good scar (on my chest!) from an unexpected motor start on the bench, now I always take the props off for any sort of testing. In your initial video, I would not have had the prop installed there either, as there is no need for it. I'm not trying to be condescending, but a lot of new flyers are pretty casual with props until they get bit by one. No doubt it looks like calcium or some other mineral deposits. The problem I see in your last pic is that the windings are broken and stretched across the whole motor. That one is done. Good advice. Thanks. I did remove it for further testing.